Total Built-Up Area - 2,336 Sq.ft. This large massive house is picture perfect for becoming a country house or weekend house. This house offers ample space and flexibility for its moderate size. The entrance columns and steps mark the entry to the house which then leads to a grand living room which boasts of a wide floor to ceiling window on one side which provides a great vista. Next to the living is a kitchen with an attached store space. The kitchen is well tucked in amongst the most common usable space so the dining table space in close by. On one side of the house is the passage leads one to the master bedroom and to the second bedroom. Each of the bedroom includes a walk-in-wardrobe attached to there private bathroom. The house is quite lateral in its alignment and also has the space for extension and becoming a ground +1 floor house if required. Overall the house can fit into any plot of size around 110 x 77 ft. ore more. 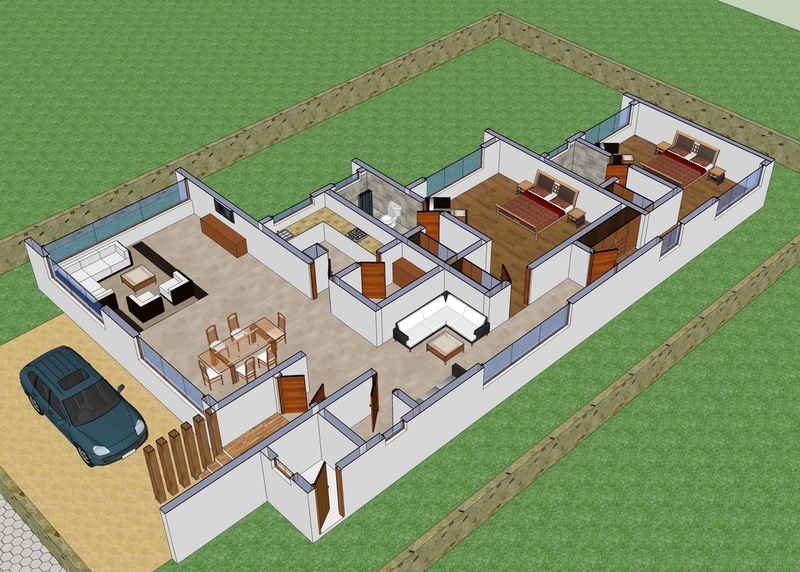 This large house also needs to have a garage space which is just outside the living room and can be accommodated well in plot sizes equal to or more than 110 x 77 ft.